“As the only Danish representatives, researchers from DTU contribute to EU’s flagship project to map the human brain: The Human Brain Project. A major international research project has previously mapped human genomes. The aim of the large-scale EU project Human Brain is to map the brain’s signalling systems, molecules and nerve cells. Denmark’s contribution to the project is not, however, traditional brain science, but is about testing new knowledge about brain functions using a technological model and in this way contribute to verify the knowledge and theses of brain researchers . “We have developed a biologically inspired control architecture which is based on artificial intelligence, and a model of the modules in the cerebellum which is the part of the brain that controls our movements,” explains postdoc Silvia Tolu who together with Professor Henrik Hautop Lund, both from DTU Electrical Engineering, are responsible for the Danish part of the Human Brain Project. Recently, Silvia Tolu and her research group were able to demonstrate the first tests where they successfully made robots react as humans. This took place at a conference in October with all participants in the Human Brain Project attending. 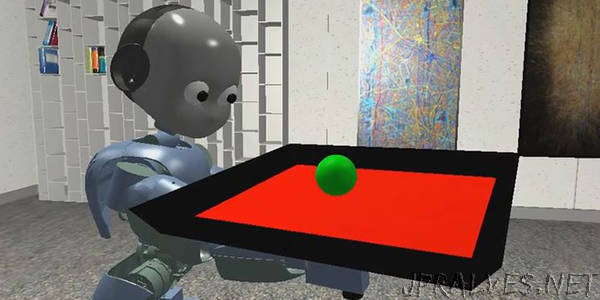 Here they demonstrated both an experiment where the humanoid robot iCub maintained focus on a fixed point, even though it was moved from side to side, and also an experiment where it balanced a ball on a plate. Finally, the researchers demonstrated experiments with two modules from the robot FABLE developed by the research group at DTU and today owned by the company ShapeRobotics. “The final experiment involves SpiNNaker (Spiking Neural Network Architecture)—a so-called neuromorphic chip designed to resemble the human brain. It is part of the Human Brain Project and used for large-scale brain simulations,” explains Silvia Tolu. Knowledge about the brain is naturally crucial if DTU researchers are to build a model of the function of the cerebellum and use it for the robots. However, experiments with robots also provide brain researchers with knowledge, so they have their theses of the brain’s functions confirmed or disproved on the basis of the experiments with the robot. If the robot is incapable of acting as expected, the brain researchers’ theses may be incorrect and must be re-tested. The first part of the Human Brain Project is completed in Spring 2018, but the robot researchers at DTU have already been told that they will continue on the project for another couple of years. However, it is too early to say anything about what the next years’ research will result in. “The knowledge currently gained in the Human Brain Project is developing rapidly. This means that we probably will be able to get the robots to mimic human movements even better than I can predict right now,” says Silvia Tolu.